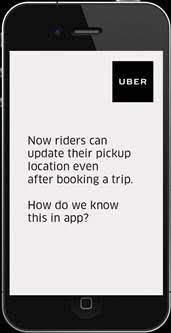 Uber, the ridesharing app that connects riders with drivers to provide convenient, reliable and affordable rides at the push of a button, today announced that riders can now update their pick up location after they’ve requested a ride, if they happened to request from the wrong place. With this cool new feature, riders can now conveniently redirect their driver partner to correct location through the app, even when the driver is en-route. “Pick-ups are one of the hardest parts of the experience to get right, and they’re especially difficult when riders accidentally request a pickup from the wrong place. It often begins with a phone call and ends with a cancelled ride. A small miscue can lead to a frustrating situation where riders aren’t riding, and drivers aren’t earning,” said Ryan Yu, Software Engineer and Rachel Holt, Regional General Manager, US and Canada at Uber in a blog post. Starting today, riders in India, on iOS and android, can update their pickup location after they’ve booked a ride. This feature has been piloted in a handful of cities and it was found that it led to less stress and fewer cancellations -- saving time and headaches for everyone involved. This feature will be made available to all riders across the India in the coming weeks. ● Be notified of the new location and have their route updated, though the experience will vary slightly for in-app and out-of-app navigation. The pickup is a core part of the Uber experience and we’re always thinking about ways for it to be as painless as possible for both riders and drivers. This simple fix gives riders more control over their pickup experience, and saves everyone time and avoidable headaches.